Need to monitor an internet or computer without having physical access to the laptop or desktop? We have developed a complete solution for this internet monitoring need. Our Realtime Spy software allows you to remotely install the software on any computer you own as well as view the monitoring logs from anywhere in the world through your personal Realtime Spy online account! See what users do, and what they type, as they perform the actions in real-time! Once you have this monitoring software installed, all log files are secretly uploaded to your personal Realtime Spy account on our webserver. This enables you to view reports in real-time from anywhere in the world! Download now and be monitoring in minutes. Realtime Spy allows you to monitor any computer you own from anywhere in the world - without the need for physical access to the PC! Realtime Spy can be remotely installed and runs in complete stealth after doing so. Realtime Spy can be remotely installed without physical presence needed for the install. Later, should you wish to remove the software, you can remotely uninstall the software without physical presence needed as well. At any time you can remotely change its logging settings without the need to reinstall the software - the changes are applied automatically. You can view the monitoring logs and change settings anytime you wish from anywhere in the world with your personal online account given to you after purchase. Logs are updated every ten minutes for constant up to date review. Monitor multiple PC's you own from any remote location without the need for extra configuration - just click on the username you wish to view reports for in your account. Usernames are categorized by what PC they are logged into for easy user selection. Realtime Spy can show you what users are doing in realtime at the exact moment they perform an action - from opening and closing programs to file activity and website visits. Realtime Spy can also show you in realtime what users are typing, as they type, along with displaying screenshots every few seconds so you can visually see exactly what they see on the computer. Realtime Spy can monitor any computer regardless of the type of internet connection it has. Other remote monitoring solutions will not work behind a firewall, router, LAN, or dial-up internet connection - Realtime Spy does! No matter what type of internet connection the computer has you will be able to view its logs from your online account. Realtime Spy operates in complete stealth and cloaks itself to hide from the users of the computer. The file you send to the remote computer can be deleted and discarded without affecting Realtime Spy's monitoring and operation. Note that Realtime Spy does tell the user that monitoring software is being installed and they have the option to install or cancel the install as this is a legal requirement we enforce. Once installed, Realtime Spy will operate in complete stealth unknowingly to any user of the computer. Realtime Spy will record nearly every single action a user performs on the computer you are monitoring - from keystrokes typed, websites visited, printer activity, files accessed, and much more! See exactly what users are doing and when in realtime! See what users do in realtime such as opening and closing programs, creating and deleting files, windows opened, websites visited, documents opened and printed, keystrokes typed, and more - as they are performing the actions! Log all keystrokes typed by the user. Logs are automatically formatted to remove backspaces for easy viewing in your online account. This includes usernames, passwords, emails and more - anything that is typed will be recorded. All POP3/SMTP emails that are sent or received by the user will be automatically forwarded to an email address you select. You will now have exact copies of all emails from the user to view. View all events users performed in chronological order - the Events Timeline lets see what events the user performed in the exact order they did them. Events logged include program starts / stops, website visits, filtering events, window viewings, and more. Log screenshots of the user desktop - see exactly what they see on the computer. All websites accessed and online searches made by the user are recorded along with the website address and duration of the visit. Realtime Spy supports the latest versions of the following web-browsers : Internet Explorer, Netscape, Opera, Mozilla, Firefox, Flock, Google Chrome, and America Online. Log all internet connections made and attempted by the user including the local host/port and the remote host/port. Log the title of every window users interact with on the computer along with the application path of the window as well. Log all print jobs executed by the user. Log all files and folder that are created and deleted by the user including those on portable and network drives. Log all files and documents accessed by the user. Realtime Spy has an array of security and stealth features built into it. It can be installed remotely, uninstalled remotely, operates in complete stealth unknowingly to any users of the computer, and is password protected from unauthorized users - only you have access to logs and settings. 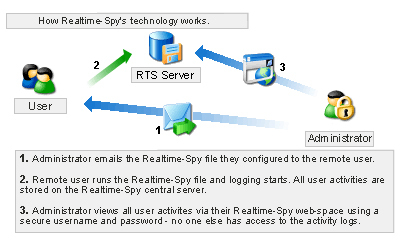 Once Realtime Spy is installed it is completely undetectable from users of the comptuer. Using minimal processing cycles it is not visible in any way to users and all logs it records are done so without user notification. Furthermore, Realtime Spy cloaks itself to hide from the users of the computer - the install file can be deleted yet the software will still run and monitor the computer. Email Installation : send the Realtime Spy install file to the computer you wish to monitor. The user only has to run the install file - they do not need to respond or send any response to start monitoring - they do, however, have to 'OK' the notice that states monitoring software is being installed on the computer. LAN / Network Installation : easily install Realtime Spy through network shares or login scripts. Users will have to 'OK' the installation with a single mouse click. All logs and settings are password protected through secure web encryption. You are the only person who can access your online account. Your monitored data is never at risk, as it is with competitor software, because there is never a direct connection to the remote computer. All data is stored securely on your personal online account with our servers for access by you only. Realtime Spy will not stop monitoring if the user reboots the computer - it will always record and monitor activities. You can remotely shutdown, restart, logoff, freeze, and lockdown the computer through your online account at any time. Realtime Spy was designed with ease of use in mind. All logs for all users of each computer you are monitoring can be viewed through your secure online account. You only need to login through any device with an internet connection and web-browser and can do so from anywhere in the world at any time. Your online account is extremely easy to use - just point and click the logs you wish to view. Clear individual logs, all logs, or entire users from your online account in seconds. Display Top 10 activity charts for computer usage (most idle and active users), file usage, website usage, and application usage. Included in your online account is an archive utility that allows you to download logs for local viewing, management, and storing outside of your online account. Quickly and easily setup Realtime Spy - just enter your username and password! Login to your online account from any device with an internet connection and web-browser - from anywhere in the world at anytime! Remotely uninstall Realtime Spy from your online account from any computer you are currently monitoring - there is no need to have physical access to the computer. Search all logs for any keywords or phrases you wish - you will be given a list of results containing matches.